Dive into the majestic mythology of Persia – where supersized heroes and magical horses challenge the selfish demands of kings; where fathers and sons meet as strangers on the battlefield and, condemned by a femme fatale queen, a lion-hearted young man journeys through fire. The Shahnameh was written over 1,000 years ago and stretches from creation to the 7th century fall of the Persian Empire. 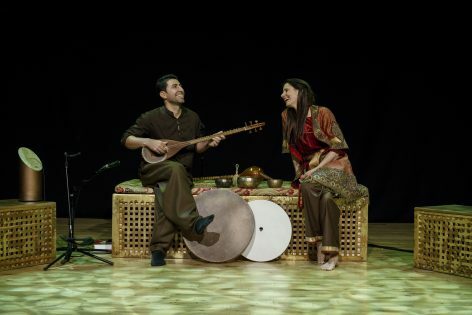 Here, a hand-picked selection of stories are brought to life by dazzling performance storyteller, Xanthe Gresham Knight and the sublime, rhythmic sounds of virtuoso Kurdish Iranian musician, Arash Moradi, on daf, setar and shurangiz.